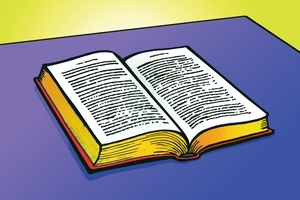 Outline: Panorama of some Old Testament stories; life of Christ; explanation of the Gospel and prayer to receive the Lord; basic teaching for a Christian life. Picture 27 features living a crucified life for sanctification. Hello! Welcome. What we are about to tell you are some of the most important words you will ever hear. It is good news for everyone. Look at the pictures and listen carefully as we tell you this good news of truth. (Especially we urge you to watch and listen to the picture messages from 17 to 27 repetitively.) Start now at the first picture. In the beginning of time, only God existed. Then God created the heavens and the earth. The world had no form and was dark. So God made the earth, and He commanded the light to shine. He made the sun and the moon and all the stars. God is good, and He rules over everything. The Book in this picture is the Bible. It is the Word of God and it tells us about God and His ways. God loves all people. What we are telling you is from the Bible. God created everything. God said, "Let there be light," and the light appeared. He made the sky. He made the sea. He commanded the land to appear, and the land was formed. 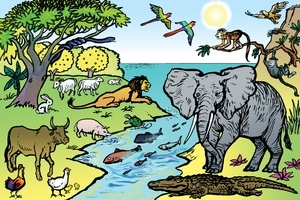 Then He created all living creatures: the fish in the water, the birds in the air, and all the animals. In this way God created everything. God was pleased with all that He made. Everything that God made was very good! 04a-God made the first man and the first woman. He called them Adam and Eve. He gave them authority over everything He had made. God made a garden for them to live in. There God walked with them and spoke with them. They were God's friends. 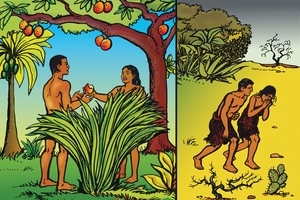 God gave them permission to eat fruit from all the trees in the garden except one. They were not permitted to eat the fruit from the tree of the knowledge of good and evil. This tree was in the middle of the garden. God's enemy named Satan came to them in the garden. 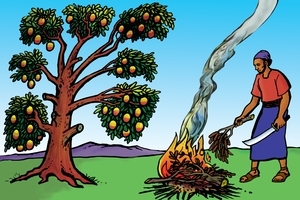 He persuaded Adam and Eve to disobey God, and they ate the forbidden fruit. 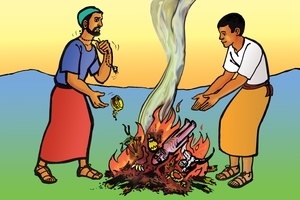 04b-They sinned against God, and they broke their friendship with Him. God punished Adam and Eve by sending them out of the beautiful garden. Adam and Eve are the ancestors of all people and we all have inherited a sinful nature from them. Since that time all people have sinned against God and are separated from Him. This is why we experience pain, sickness and death. Adam and Eve had two sons. Their names were Cain and Abel. Abel pleased God but Cain did not. 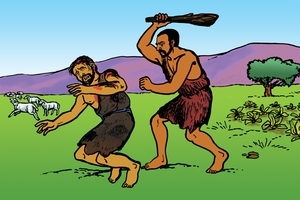 Cain became jealous of Abel, and one day he killed his brother. God punished Cain for doing this terrible thing. God is angry when people sin. God wanted to have close fellowship with people but sin completely separated everyone from God. Many generations went by and Adam and Eve had many descendants. All those people sinned and disobeyed God. 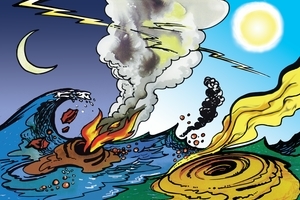 The sin of the people became so great that God decided to destroy them by a great flood. There was only one man who loved and obeyed God. His name was Noah. 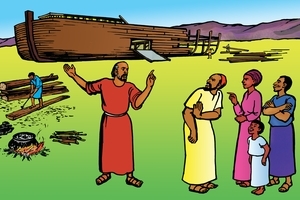 God told Noah to build a big ship so that he and his family could be saved from the flood. 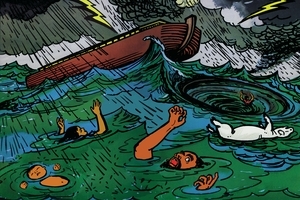 As Noah built the ship, he warned the people about God's judgment and the flood that was coming. However, the people would not believe Noah's warnings. They laughed at him and they refused to turn from their evil ways. God brought animals of every kind to Noah, and Noah took them into the ship. Then Noah and his wife, their three sons and their wives, also entered the ship. There were only eight people in the ship along with the animals. Then God closed the door. After seven days God sent very heavy rain and He brought water from under the ground day and night. It rained for 40 days until water flooded the whole earth. It was too late for anyone outside the ship to be saved. They all drowned. 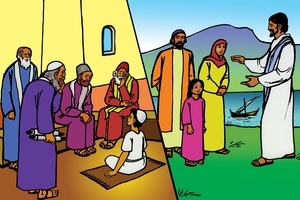 However, Noah and his family were safe inside the ship because they believed and obeyed God. 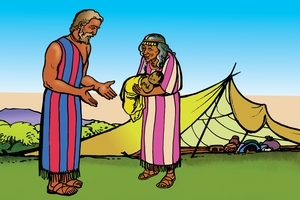 Many years later the descendants of Noah became many tribes. Abraham was one of Noah's descendants. He was a man who loved and obeyed God. God promised Abraham that his descendants would become a great nation. 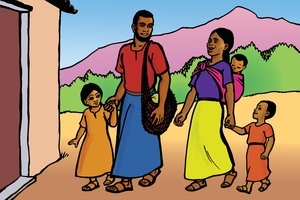 Abraham and his wife Sarah did not have any children, but they still believed God's promise. After years of waiting for the fulfillment of God's promise, they still did not have a child. So, Abraham had a child by his slave woman. The child born of the slave woman was named Ishmael. He became the father of the Arab nations. When Abraham and Sarah became too old to bear a child, God kept His promise and they had a son. They called him Isaac. God promised to bless all people through Isaac and his descendants. The descendants of Isaac became a great nation called Israel. 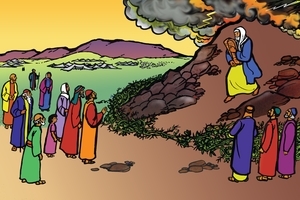 Moses was one of the descendants of Isaac. He believed God and obeyed Him. God called Moses to Mount Sinai and He spoke with him. God gave Moses His laws to teach the people. Moses came down from the mountain with the laws of God written on two pieces of stone. God wants everyone to obey His laws. will receive God's blessing. These are God's laws. (1)We must love, worship and obey only the one true God. (2) Do not make any idols or bow down to them. (3) Do not use God's name in a disrespectful way. (4) Set aside one day each week to rest and worship God. 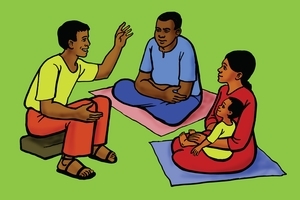 (5) Children must obey and honor their parents. (7) Do not commit adultery. (9) Do not give any false testimony against your neighbors. (10) Do not covet the things that belong to other people. 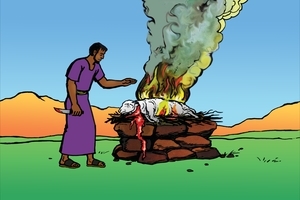 In the time of Moses when a person broke God's laws, he had to sacrifice a lamb to God. The lamb died in place of the law breaker. This reminded the people that it was wrong to sin against God by breaking His laws, and that the penalty for sin was death. The lamb was also a symbol. It pointed to a much greater sacrifice that would come later. God planned to send His Son who would die to take away the sins of people. Jesus is called the Lamb of God. He was going to come into the world to become the sacrifice for all people. 12a- Many years later, an angel from heaven was sent to a young virgin named Mary. Mary was promised in marriage to a man named Joseph. The angel said to Mary, "You have found favor with God. You will give birth to a son and you will call Him Jesus. Mary asked, "How can this happen since I am a virgin?" The angel answered, "The Holy Spirit will come upon you and you will conceive a child. So, the Holy One to be born will be called the Son of God." 12b-The angel also appeared to Joseph in a dream. The angel said, "Joseph, do not be afraid to take Mary as your wife, because what is conceived in her is from the Holy Spirit. She will give birth to a son and you are to give Him the name Jesus." 'Jesus' means 'Saviour,' one who will save his people from their sins. Joseph took Mary as his wife but he did not sleep with her until after the baby was born. About that time, a Roman emperor commanded all people to return to the towns of their ancestors to be registered. Mary and Joseph had to travel to the town of Bethlehem. When they arrived, there was nowhere for them to stay except in an animal stable. It was there that Mary gave birth to the baby Jesus. The same night an angel appeared to some shepherds who were watching their sheep in a field nearby. The angel said, "I bring you good news for all people. Today the Savior has been born to you. He is Christ the Lord!" Christ is a title that means 'chosen by God.' He is the one God promised to send to save His people. "Lord" is a title that means "Divine Ruler." Suddenly many more angels appeared in the sky, singing and praising God. The shepherds said to one another, "Let us go to Bethlehem and see the things that have happened, which the Lord has told us about." 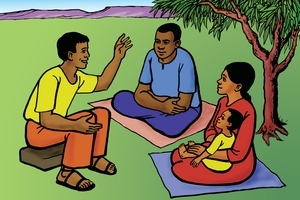 When they had seen Jesus, they spread the word concerning what they had been told them about this child. Everyone who heard it was amazed. 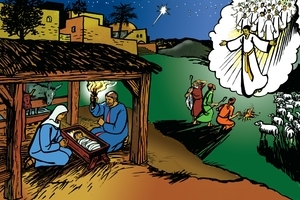 14a-Jesus grew up in the home of Mary and Joseph. When He was twelve years old, Mary and Joseph took Him to Jerusalem. He talked about God with the teachers and leaders of the people. He listened to them, and asked them questions. They were all surprised at His great knowledge of God. 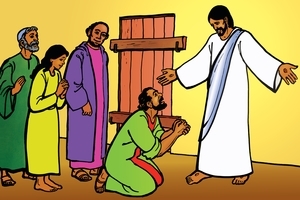 14b-When Jesus was thirty years old, He began to teach the people about God. Many believed His teaching and followed Him. However, some religious leaders did not believe and they opposed Him. 15a-Jesus had great power from God. He performed many miracles. He healed the sick and made blind people see. 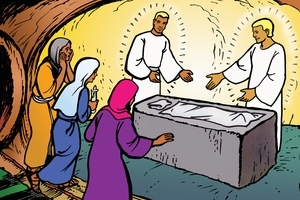 15b-He spoke to dead people and they came back to life. 15c-He calmed storms and walked on water. When the people saw these miracles many believed that He had come from God. 15-They were amazed by all that Jesus did and said. Jesus has the power to help us also. Jesus did wonderful things, and many people followed Him. He helped many people and taught the ways of God. Jesus came to show God's love, and to bring people back to God. However, the religious leaders were jealous of Jesus. Their hearts were hardened, and they did not believe that He was sent from God. They refused to admit that they had broken God's law and that they were sinners. Those leaders told lies about Jesus and they had Him arrested. The soldiers whipped Him. 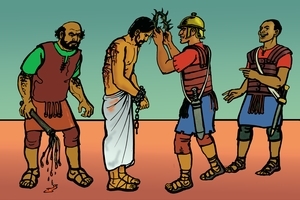 They placed a crown made of thorns on His head and they mocked Him. Remember, Jesus was the Son of God. He had the power to destroy those people, but He did not resist them. He knew this was in God's plan. 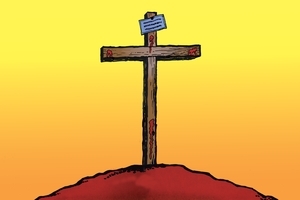 The soldiers nailed Jesus to a wooden cross and He hung there until He died. In those days it was a custom to kill law breakers in that cruel way. 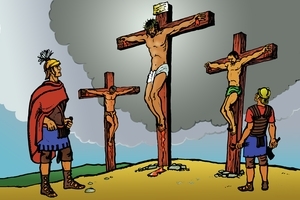 Two criminals were also crucified (nailed to wooden crosses) with Jesus. However, Jesus was not a criminal. He had done nothing wrong. Jesus died for our sins, and he received the punishment which we deserved. We have all sinned and we should die for our own sins. Jesus became the sacrifice to pay for the sins of all people. If we confess that we are sinners and turn from our sins, God will forgive us. Believe in the Lord Jesus Christ and you will be saved. The enemies of Jesus thought that they destroyed Him, but that was not so! 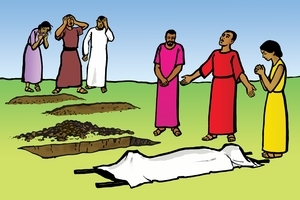 After Jesus died on the cross, His friends put His dead body in a cave. They closed the entrance of the cave with a big stone. Two days passed but on the third day Jesus rose from the dead, just as He said He would. Some women went to the cave to perform the burial customs. They found the stone rolled away and the body of Jesus had gone. Two angels appeared and told them that Jesus was alive. They said, "He is not here. He has risen!" Yes, Jesus had risen from the dead! He showed that He truly was God's Son. Jesus is alive today and He has overcome Satan and death forever. After Jesus rose from the dead He appeared to His followers. He talked and ate with them. One of them, who was called Thomas, was not with them. He said, "Unless I see His nail wounds and touch them, I will not believe that Jesus is alive again." A week later, the Lord Jesus appeared again and this time Thomas was there, just as you see in this picture. Thomas fell down on his knees before Jesus Christ and said, "My Lord and my God!" Thomas had no more doubts. Jesus said, "You believe because you see Me. Happy are those who do not see Me, and yet believe." 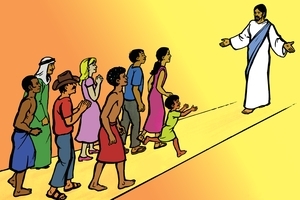 After Jesus rose from the dead, He appeared to many people. They saw Him and they knew that He had defeated death and was alive. Forty days later the time came for Jesus to go back to Heaven. He had finished the work He came to do. Jesus said, "Go and make disciples in all nations. Teach them to obey everything I have commanded you." 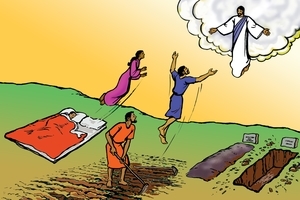 As Jesus' followers watched, He rose up from the earth and disappeared from their sight in a cloud. Just then, two angels appeared. They told the disciples that Jesus would return one day in the same way that they had seen Him go. Jesus Christ is now in heaven. He is preparing a place for all those who follow Him. Will you believe and follow the Lord Jesus? Will you be ready to meet Him when He returns? Why did Jesus die on the cross? Jesus died to save sinners from the punishment of sin. Jesus never sinned. The cross reminds us that He died to take away the sin that separates us from God. Jesus is the holy, sinless, Lamb of God. He was sacrificed for us. When we believe in Jesus and turn from our sin, God forgives us. Jesus makes us God's children. 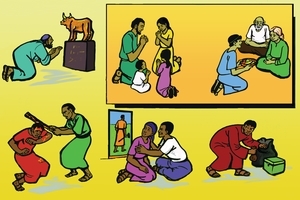 The following pictures will help you understand what it means to be a child of God and a follower of the Lord Jesus Christ. Jesus taught about the way to have eternal life. Everyone starts out on the wide road of sin because we all have a sinful nature which we inherited from Adam. 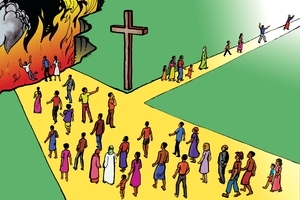 The narrow road leads to God and to everlasting life in heaven. The Lord Jesus said that we should turn into the narrow road. You can see in the picture a cross standing at the entrance to the narrow way. We enter that way when we repent of (turn away from) our sins and believe that Jesus died on the cross for us. Many people do not want to turn from their sins. The way to heaven is too narrow for them. They go on following the wide road to destruction in hell. Which road are you following? Why not speak to God now? Say to Him, "Lord God, you are great and holy. I confess to You that I have sinned. I believe that Jesus Christ died on the cross to take the punishment for my sin. Please forgive me. Cleanse me from sin and make me one of Your children. I want to follow the way of Jesus and live with You in Heaven when I die. Thank You, Lord." In this picture you can see Jesus Christ. He is welcoming people from all of the tribes, nations and language groups. They believe in Him and have become the children of God. They are on the narrow road which leads to Heaven. The children of God are like one big family. They may be rich or poor, black or white. There are men, women and children. They are all united together thanks to the Lord Jesus Christ. 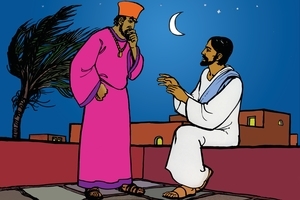 When Jesus was on earth, there was an important (Jewish) teacher (of religion) named Nicodemus. One night he went to Jesus to ask Him some questions. Jesus told him an amazing thing. He said that anyone who wants to become a child of God must be born again. We became a member of our parents' family when we were born. Likewise, we enter into God's family when we are born a second time. The first is a physical birth; the second is a spiritual birth. Through this spiritual birth, the Holy Spirit of God gives us new life. God puts the spiritual life of Jesus in us when we trust in Him. He becomes our Savior and Lord. This is the beginning of our new spiritual life. We become new people, the people of God. Our new life must grow, so that we become more like Jesus each day. 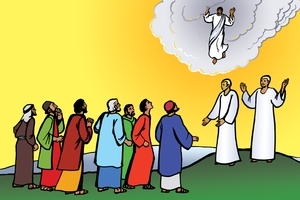 Before He went back to Heaven, Jesus promised His followers that He would send them the Holy Spirit. Ten days after Jesus returned to Heaven, His followers were all together in one place. You can see them in this picture. Suddenly, there was a sound like a great wind. 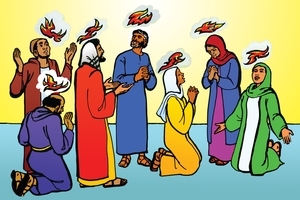 Tongues like fire appeared above each of the followers. The Holy Spirit came and filled them all, just as Jesus Christ had promised. People from many nations were in Jerusalem that day. 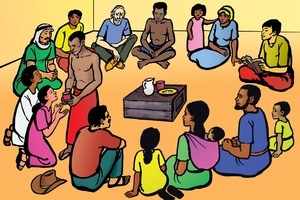 The followers received power to speak to them in their own languages. They told the gathered people about the wonderful things that God had done. 3000 people turned to Jesus Christ that day. Today the Holy Spirit lives in all people who truly follow the Lord Jesus. The Holy Spirit gives us power to obey Jesus Christ and to tell others about Him. 26a-Before a person believes in Jesus Christ, he is like the man in the picture who is walking in the dark. He stumbles and often falls because he has no light to guide him. 26b-When we trust in the Lord Jesus, we become like the man walking along the road on a sunny day! We can see where we are going. We do not fall even when the way is rough. The Lord Jesus said, "I am the Light of the world. If a man follows Me, he will not walk in darkness." The Lord Jesus wants His people to walk in the light of His goodness, and to become better and better. He gives His Holy Spirit to guide all believers in His way. When we become a follower of Jesus Christ we become new persons. We want to obey God. He has given us His instruction in His book, the Bible. We are thankful that God has forgiven our sin and given us a new life. We want to please Him in everything we do. Jesus is our Saviour. He is also our Lord, the ruler of our lives. As followers of the Lord Jesus Christ, we do not want to commit adultery or fight. We do not want to steal and we do not want to worship idols or other false gods. The Bible tells us not to be proud, but to be humble. We are not to be selfish, but to love others and share with them. We are not to be angry, but to be wise and reasonable in all our actions. When we accept Jesus as our Lord and Saviour, we are born again and the Holy Spirit comes to live in us. As we grow spiritually, the Holy Spirit gives us the ability to live in the right way to honor God more and more. In our new life, we turn away from doing all the old things we did before. This is just like you see the man is doing in the picture. We turn away from our old life. In the old life, we rejected God's rule, for which the punishment is death. Now, we crucify this old life (put this old life to death) and reject all that (do not do what) it wants. The Holy Spirit lives in us helping us not do what the old life wants. God tells us that we were crucified (our old life died) with Christ. We have also been raised again with Him (a new life has begun). Now we live with God's Spirit living in us helping us to live a new life of doing good more and more. When a family is truly walking in Jesus Christ's way, the husband loves his wife and the wife honors her husband. This is what the Word of God teaches. The husband and the wife help and encourage each other. They teach their children to love God and obey His Word. The family that honors God stays together during times of trouble. They should pray and work together in harmony. 29a-The Lord Jesus taught His followers, "Love your enemies and pray for those who persecute you." We should even love our enemies that we may be sons of our Father in Heaven. 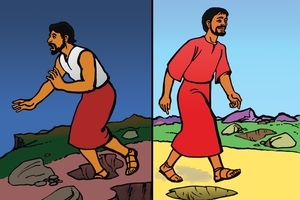 29b-Jesus told a story about a man who was traveling along a road. Robbers attacked him and beat him and went away, leaving him half dead. A man from another tribe found the badly injured man. He bandaged his wounds. 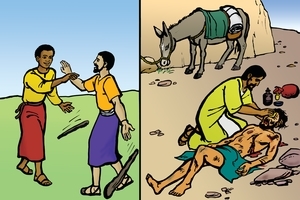 He put the man on his own donkey and took him to an inn where he took care of him. He himself paid the innkeeper to look after the sick man until he was better. Jesus said we too should love and help people who are in need, even people of other races or religions. The people in this picture are burning their idols and fetishes. They used to worship Satan but now they follow Jesus Christ. Jesus' followers must not worship evil spirits. We do not have to fear them or serve them. The Lord Jesus is more powerful than Satan and evil spirits. Believers must get rid of everything that binds and leads them to Satan and evil spirits. The Lord Jesus will protect us from them when we ask Him. Once there was a man who was possessed by many evil spirits. 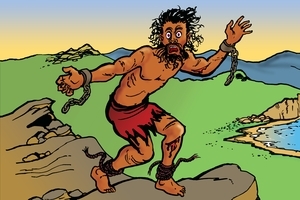 Ropes and chains could not hold him because the evil spirits inside him were so strong. Jesus commanded those spirits to come out of the man, and they did! That man was freed from the power of the spirits. He went and told all his friends what Jesus had done for him. 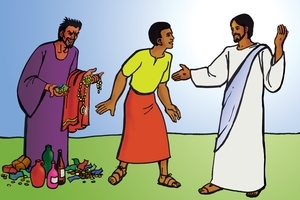 Jesus delivered many people from evil spirits. Satan and evil spirits must obey Him. You may be a believer, but you might be disturbed by evil spirits. Remember that you belong to God. Satan has no place in your life. Resist him and ask the powerful Lord Jesus to send those evil spirits away. Ask other believers to pray with you. Jesus Christ is much more powerful than any evil spirit. When you obey Jesus, His power will protect you and Satan cannot harm you. Satan tries to tempt God's children when he gets a chance. He wants them to stop following the Lord Jesus. Satan will try to tempt the believers with things like money, clothes (possessions), tobacco (drugs), strong drink and immoral living. He wants us to believe that these things will make us happy. However, Satan is a liar. He wants to deceive us and turn us against God. Ask the Lord to help you resist and overcome this temptation. Trust Christ Jesus and follow only Him. What happens if a believer sins? 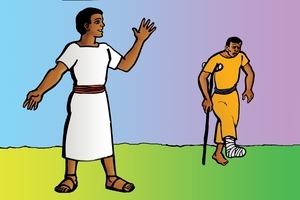 Jesus told this story: A young man left home, went far away, and did many evil things. He greatly sinned by committing adultery and wasting his father's money. Then there was a severe famine. He became very poor and hungry. He longed to fill his stomach with the pods that the pigs were eating, but no one gave him any food. Then he knew that he had sinned against God and his father. He truly regretted what he had done. He returned to his father. His father loved his son even though he had sinned greatly. 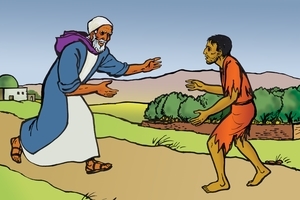 With great joy he received the young man back again and forgave him. If we sin, we must truly be sorry and repent, turn away from our sin. God will then forgive us, and He will receive us again like the father in this story. Jesus said, "There is rejoicing in heaven over one sinner who repents." 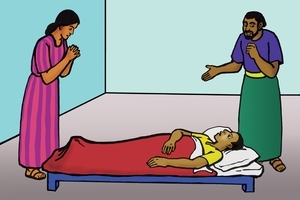 What should God's people do when they become sick? They should first talk to God and trust Him to do whatever is best. 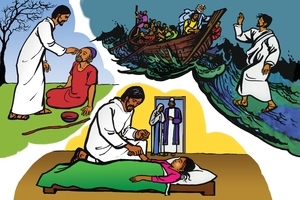 God is able to heal the sick person if He wills. God loves us and controls all that happens to us. Jesus is with us to give peace and to help us in times of sickness. In this picture we see people burying their dead as was their custom. One day we will all die. But what happens to us then? 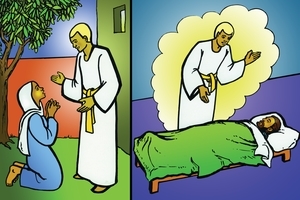 God's Word, the Bible, says that when a believer dies, his spirit goes to be with the Lord Jesus in heaven. The family and friends of the believer in the picture are sad but they are not overcome with grief. We need not be afraid of death. God loves us and has saved us from sin and everlasting death. Unbelievers do not have this hope of eternal life with God. The Bible says that they go to a place of eternal punishment. Where will you go when you die? Each part of our body has its own purpose. The eye is for seeing, the ear for hearing, and the mouth for talking and eating. All the parts of the body work together. If one part is sick or injured, the whole body suffers. God says that believers are parts of one body called the Church. Jesus Christ is the Head of that body. God has work for every believer to do, for example, preaching, singing, serving, teaching, giving hospitality, and helping others. 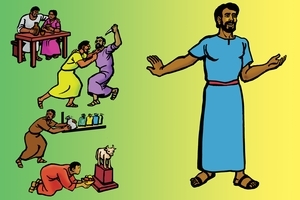 If one believer fails to do his part, the whole body of the Church will suffer. All believers must work together to honor God and serve each other. Believers meet together regularly to worship God. When they meet they learn from the Bible, pray to God, and worship Him. They should bring offerings for the work of God. The Lord Jesus instructed His followers to remember His death. In this picture you can see believers eating and drinking together. The broken bread which they are eating reminds them of the broken body of Jesus when He died on the cross. As they drink together they remember His blood which was shed to save them from sin. We too should meet and remember the death of Jesus in this way until He comes back again. One day Christ Jesus will return to earth from heaven, just as He promised. He will come suddenly when people do not expect Him. Believers who have died will rise from their graves to meet Him. Those who are still alive will join them, but all will suddenly be changed. Together they will meet the Lord in the air. They will be made perfect, to be with Him in heaven forever. Unbelievers will be left behind. They will suffer the judgment of God. We do not know when Jesus Christ will return, but we must always be ready and waiting for Him. Would you be ready to meet the Lord Jesus if He returned today? The tree in this picture has much fruit. When we follow Jesus Christ, God's Spirit works in us to produce fruit. The Bible tells us that the fruit of God's Spirit is love, joy, peace, patience, kindness, goodness, faithfulness, gentleness, and self-control. Jesus said, "I am the vine. You are the branches. If you stay in Me, and I in you, you will bear much fruit." Dead branches do not bear fruit. They will be cut down and burned. Jesus wants His followers to produce much fruit. This honors God and helps other people. Anyone who believes in Him will be saved from sin, everlasting punishment, and death. If you are a believer you must help others to understand this Good News. God's Holy Spirit will give you the courage to live and speak for Him. Use this DVD (tape, CD or leaflet) to tell others what you have learned. In this way many people will come to know the truth about God, and our Saviour, the Lord Jesus Christ. GRN has recorded a version of this script in 37 languages and dialects. See full list.